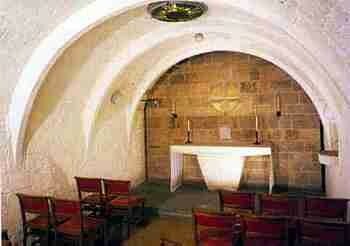 The chapel of St Francis of Assisi, with its barrel vaulted ceiling, is a crypt dating from c.1280. It was lost for some 300 years before being rediscovered in 1925. The original entrance was from the chancel above by the steps now in the west wall. Evidence suggests that in 1452 it was a Lady Chapel. The chapel is linked by a 'squint' (narrow window) to the neighbouring Oratory of St Clare, where you will see the symbol of the Toc H Women's Association, the 'Lamp of the Magnificat,' behind a grille.